South Lake Tahoe biking, for our purposes, can be divided into biking and mountain biking. Despite the recent upsurge in the popularity of mountain biking, many visitors to the Lake Tahoe region still prefer to do their bicycle riding on paved roadways without too many frame bending bumps and drops. 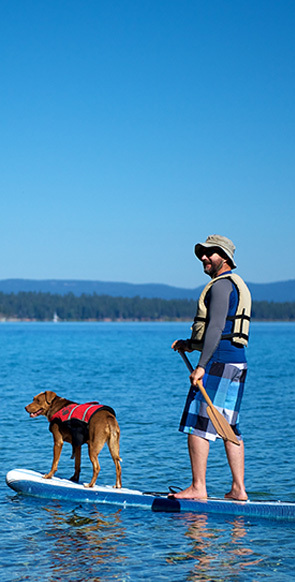 Families, especially, find the traditional bicycle paths a great way to get some exercise while discovering both the natural beauty of Lake Tahoe and the many man made sights along the way. In the neighborhood of South Lake Tahoe, the Pope-Baldwin Bike Path is a paved path beginning at the beach of the same name just to the south of Emerald Bay. Along its 3-1/2 mile route Pope-Baldwin passes Camp Richardson, the Tallac Historic Site – where riders are encouraged to stop and tour the area –, and along the shoreline of Fallen Leaf Lake. The route is mostly flat. The South Lake Tahoe Bike Path, sometimes called the Forest Bicycle Trail, begins at El Dorado Beach in the South Lake Tahoe Recreation Area, or if you follow the South Lake Tahoe Chamber of Commerce's suggestion, it begins at the Crescent V Shopping Center. The path passes over Trout Creek and the Upper Truckee River and passes along the lakeshore ultimately connecting with the Pope-Baldwin Bike Path up near Emerald Bay. The trail is paved with blacktop and passes through a good ten miles of forest. The Baldwin Estate and the Forest Service Visitor Center are both good places to stop along the route for some sightseeing and rest. If you've thought ahead and are staying at the 3 Peaks Resort and Beach Club, you have probably rented a cabin with a Jacuzzi. So when you complete your ride a moment of relaxation will help you transition from the mountains, the dirt, and the sweat to the perfume, the comfortable clothing, and the evening's entertainment.